When I attended a talk by Wael Ghoneim at the London School of Economics in January I was quite surprised when he briefly referred himself to the crowd as not a fan of the late President Jamal Abd al-Nasir. I asked my father why... and I learnt he had imprisoned quite a considerable number of Ikhwan Al-Muslimun (Muslim Brotherhood) members. So the dude made some mistakes.. 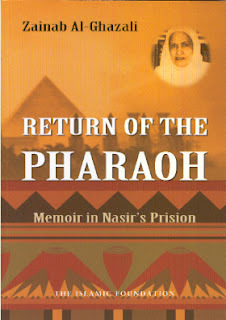 I had not been aware of how grievous these mistakes were until I read Zainab Al-Ghazali Al-Jubaili's memoir of her time in Prison under Nasir's reign. Al-Ghazali was an active president of the Muslim Ladies' Group in the early sixties. And had given her life to the cause of Islam at the tender age of 18. She swore allegiance to the founder and leader of the Muslim Brother hood, Hassan Al-Banna, only shortly before he was assassinated by Nasir's secret police. Under Nasir's rule the brotherhood was supposedly disbanded but Al-Ghazali and two other men helped in restoring it. Ironically, nasir was one a member of the brotherhood too. I doubt he started off bad, but he probably ended up evil... which seems to be the trend among Egyptian presidents. Al-Ghazali describes in her book, her distaste of the Egyptian society's lacking moral conduct (having been influenced by the British) and it's rulers who seemed content at it's lack of Islamic practise. She and a few others then created a plan to educate the youth in the matters of Islam in order to endorse a practising society and eventually establish an Islamic state. In the 60's Nasir had experienced a failed assassination by the Ikhwan al-Muslimun, this resulted in thousands upon thousands of members being imprisoned under the emergency law (which still presides in Egypt to this day thanks to Sadat and Mubarek), where men and women were snatched from their homes and thrown into military prison with no warrant, allegation or even suspicion. The accused were then tortured to provide names and information about the assassination and attempts at future assassinations... not knowing they had given the group further motive for assassination. Al-Ghazali's tale was just one of many who remain unnamed and unacknowledged, but her tale took such a wide public notice when she was released from prison in 1971 because she was a woman, and no one had any idea a woman could have been treated so brutally by the state. She resided in military prison for approximately 2 years, where she was starved, whipped, beaten, crucified, set at by mice, snakes and starved dogs. She was made to sit in a room of filthy water and beaten if she moved or slept. She was suspended in the air, hanging upside and given 500 lashes (five times the amount of the Islamic punishment for fornication), then put back in the cell of water or thrown to dogs. She was dragged from prayer, given nothing to drink, humiliated and forbidden from the toilet for days on end. The cycle would repeat itself until she wrote down a false confession or gave names of relevance, which she simply didn't do, she just became so close to death that she had to be hospitalised several times. Naturally, one cannot easily understand her experience, perhaps only those who have experienced the same pain and torture can truly empathise with her. But her faith (Iman) in Allah was truly inspiring as she described how she would recite chapters of the Quran, or repeat the 99 names of Allah while being tortured to get her through it. Growing thicker skin in the process was probably inevitable and so some of her words I found too strong, she had undoubtedly developed a passion against the government and believed the Nair regime to be acting so wholly ungodly. I'll admit that I did not agree to every word she said, but what was undeniable was her strength of character, her gutsy bravery and her true adoration for her religion and the one God. She and the brotherhood suffered what no humans could possibly endure yet she bore it all with the strength of Allah and that in itself is evidence to His presence. She was very delicate when writing about the attempted rapes against her, she described a few encounters, one where the soldier wished to do her no harm and was subsequently beaten and shot for acting against orders. The other encounter was where the soldier begged her to confess to something or say any names, she naturally refused as she had been doing all along, and when he approached her she bit down on his neck, the next thing she knew... a body was lying in front of her (her captors were obviously shocked, she says it was Allah who gave her strength to protect her self). The third attempt was where her torturer said he ordered a group of men to be intoxicated by alcohol and hashish before she was to be thrown at them, but in fact they had become so intoxicated that they had to be hospitalised. These events show she had been protected, but if she had been really raped, which seems inevitable for a woman in a military prison for two years, then I doubt she would have written about it, it probably being too disturbing for her to repeat. Despite the pain she went through, the saddest thing about the book I found was the role of doctors, they would check on the inmates only to keep them alive for further torturing; bringing them back to conscious with smelling salts when they had passed out from too much torture. I cannot portray how much this book affected me. In some ways I feel ashamed, in other ways I feel betrayed. But the most certain effect on me has been the reaffirmation of my faith, that despite living a cyclic routine in a busy modern city, Allah is always there, affecting everything I do. I hope Zainab Al-Ghazali's books and biography continue to inspire future generations to come.